So how can you reach us? Desert Ashram is built on the ruins of an historical military settlement called Shitim. Some of the people you might ask along the way will have never heard of "Desert Ashram", but will know where "Shitim" is. If you are hiking on The Israel National Trail (Shvil Yisra'el), we are right on it! The section of the trail between Zihor stream and Hayun stream passes right next to us, and you can stop over the night, for a relaxing hot shower, a good vegetarian meal and a warm bed, before moving on. Cyclers on the Israel National Trail will find that in this area, it runs on route 40, and we are located right next to it – you can simply drop by. Desert Ashram is situated in the Shitim settlement, right next to route 40, between Zihor junction and Shizafon junction. If you're driving from the north it's about 70km south of Mitzpe Ramon, cross the Macktesh and go straight all the time (a 45 minute drive), and in Zihor T junction, continue right for about 7 minutes. Desert Ashram will be the first settlement you'll see on your left. If you are driving from the south, it's 85km north of Eilat. Take route 90 (the Arava Route), and turn left on Ketura junction (towards Ne'ot Semadar or Shizafon). 12 minutes after passing Kibbutz Ne'ot Semadar you'll see Desert Ashram to your right. For a map of the area's main roads, press here. Bus no. 392 that runs between Be'er Sheva and Eilat passes right next to us. Here is the Egged Bus Company's journey planner. The name of our stop is "Shitim – Branching". 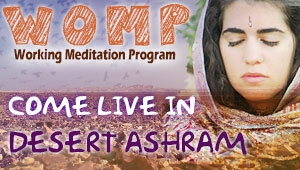 The Ashram itself is very near the drop-off point, a minute's walk away. The train can only take you from the north of the country as far south as Be'er Sheva (here is the Israel Railways journey planner). You get off at the last station, Be'er Sheva Center (Be'er Sheva Merkaz), which is right by the main bus station, where you will need to take the aforementioned no. 392 bus. Flights from all over the world arrive at Israel's InternationalBen Gurion Airport (for Transportation to and from the airportpress here). If you are using public transportation to get directly here, the cheapest way is to take a train from the airport to one of the Tel Aviv stations, change to a train down to Be'er Sheva and from there to take bus no. 392. Eilat's International Airport is located in Ovda, and receives certain charter flights (press here for transportation to and from this airport). To get to the Ashram by public transportation from there directly, just take bus no. 392 northbound.